The Medtronic SynchroMed II drug infusion pump has been linked to reports of accidental overdose, underdose, life-threatening withdrawals and at least 14 patient deaths. According to a warning sent to doctors by Medtronic, some older Medtronic Synchromed II drug infusion pumps may have a failure rate greater than three percent, because of battery issues that may cause the implanted pain pump device to fail prematurely. Free Confidential Lawsuit Evaluation: If you or a loved one was injured or died as result of a Medtronic pain pump malfunction, you should contact our law firm immediately at 888-210-9693. You may be entitled to compensation by filing a suit against the Medtronic and our lawyers can help. What is the SynchroMed II Pump? The Medtronic SynchroMed II infusion pump, known as a pain pump, is a medical device that is implanted surgically. The Medtronic SynchroMed II infusion pump uses a plastic tube or catheter to deliver pain medication near the patient’s spinal cord. The battery powered Medtronic SynchroMed II infusion pump is implanted under the skin. The pump is used to treat patients with primary or metastatic cancer, severe muscle spasms, chronic pain, and other severe painful health conditions. The SynchroMed II was approved by the U.S. Food & Drug Administration (FDA) in 2004, and there are currently about 270,000 of the pumps on the market. 2006 – Side effects linked to the manufacture of Medtronic Pain Pumps, resulting in over or under-infusion of pain medications for patients. 2007 – Class I Recall issued for the Medtronic SynchroMed El Implantable Infusion Pump. The devices, which are part of the SynchroMed EL Infusion System, were found to stall at a high rate, exposing patients to the risk of serious injury and death. 2009 – Medtronic sent a letter to doctors warning about battery problems with the SynchroMed II. Battery power issues may lead to device failure and the release of too much or too little pain medication. 2011 – Medtronic sent a letter warning doctors about a design flaw that could potentially lead to “pocket fills” during device refills. February 2011 – Class I Recall issued for the Medtronic SynchroMed II Infusion Pump due to the “pocket fill” design flaw. 2011 – FDA issued a Class I Recall for SynchroMed II Infusion Pumps because of battery problems first warned about in 2009. 2012 – FDA sent a warning letter to Medtronic citing the company for failing to fix problems with the SynchroMed Pain Pump, including the devices stalling because of motor corrosion and failing to deliver medication. 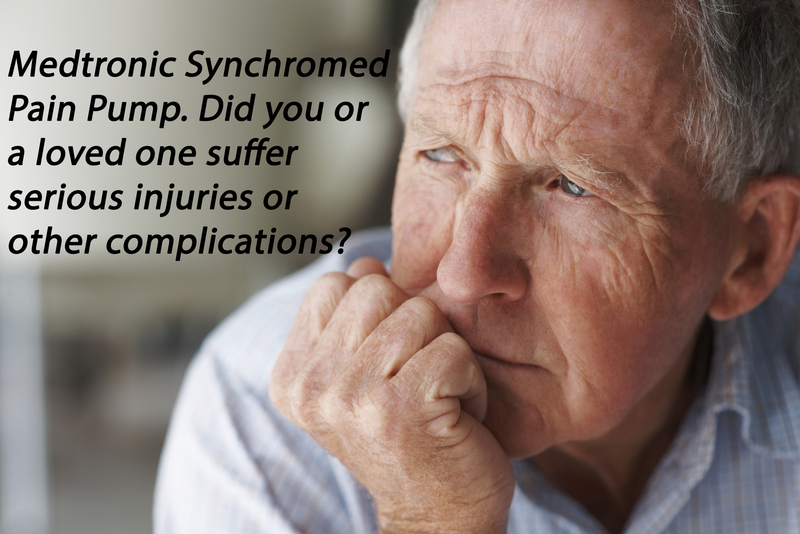 2013 – Medtronic warned doctors of 4 potential flaws with the SynchroMed Infusion Pump. All 4 defects were classified by the FDA as Class 1 recalls, which can lead to serious injury or death. At least 14 deaths have been linked to Medtronic Infusion Pumps. The deaths occurred because patients were either deprived of pain medication and entered withdrawal, or after drug overdoses. A blockage that stopped the pain drug’s flow led to 2 deaths, and an electrical short caused one death, according to WSJ. According to Medtronic, 11 of the deaths occurred between 1996 and April 2013. Medtronic does not recommend that patients already implanted with the infusion pumps have them removed. They should, however, contact a doctor right away if they notice a change or return of symptoms, or hear an alarm which signals that the pump motor has stalled. On April 27, 2015, federal authorities reached a proposed consent agreement with Medtronic for failing to correct violations with its SynchroMed Pump, according to the Wall Street Journal. According to the complaint, the infusion pumps weren’t produced in accordance with current manufacturing standards. Can I file a Medtronic SynchroMed Infusion Pump Lawsuit? The Dr. Shezad Malik law firm represents injured plaintiffs in Medtronic Infusion Pump lawsuits. We are handling litigation nationwide and currently accepting new injury and death cases in all 50 states. Medtronic is recalling the SynchroMed Implantable Infusion Pumps because a software problem may cause unintended delivery of pain drugs during a priming bolus procedure, used to quickly deliver a large dose of medication from the device to the patient’s spine. During this procedure, patients may receive the drug unintentionally at a high rate of infusion in the cerebrospinal fluid followed by a period of reduced drug delivery after the priming bolus. This can result in a drug overdose or underdose which can lead to serious adverse health consequences such as respiratory depression, coma or death. On October 7, 2016, Medtronic initiated an updated recall to communications issued on May 14, 2013. Medtronic made a software change to the Synchromed II application contained on the Model 8870 software application card. This change will correct the priming volume associated with the priming bolus function. They also updated the labeling related to the software change and priming bolus function. In September 2016, Medtronic sent an Urgent Medical Device notice to affected patients. The notice provided a description of the software change, description of labeling changes, 8870 software card recommendations, and new priming bolus recommendations. Continue to use the current software card and it's displayed tubing volume until the Medtronic Representative has exchanged the current card with the new software card (new version is AAU0). Medtronic Representatives began visiting affected customers on October 3, 2016, to replace software application cards with the updated version (AAU01).